So, you want to photograph the sunrise? I don’t blame you - this is my favourite time of day to take photos, the start of a new day. I have been using a Canon 6D with Canon 17-40mm lens for most of my sunrise photography. The Canon 6D is a full-frame DSLR. I will go through the settings one by one and then describe the settings I used for the 5 photos included in this post. I will conclude with a brief word about processing sunrise photos using Lightroom. In this post I am explaining the camera settings that I use to photograph sunrises. They work for me and allow me to concentrate on the sunrise itself and not fiddling with my camera at all. This is not a technical article, I am explaining my sure-fire way of getting great sunrise photos every time using tried and tested camera settings. There are those who will not agree with my approach – that is absolutely fine – this is how I do it. The basics of taking photographs – the exposure triangle. First things first. Every time you take a photo there are three elements that have to be set to ensure a correct exposure. These settings apply to any camera. F8/ F16. F8 is the sweet spot on my Canon 17-40mm lens, and also my Canon 24-105mm lens. This is my starting aperture every time I go out to shoot. When do I vary from this? When I want to change the depth of field, i.e. how much of the photo is in focus. For sunrise photography I will typically choose F16 or F22. F16 is my aperture of choice if I want the maximum depth of field without getting lens-induced errors. If I am shooting straight into the sun and I want a starburst effect on the sun then I will go the minimum aperture of my Canon 17-40mm lens, which is F22. I use the AV mode on my Canon 6D. AV stands for Aperture Value. In AV mode I select the aperture and the camera sets the shutter speed for the correct exposure automatically. Hold that thought for now – I will come back to this after the third element of the exposure triangle. I use ISO100. This is the lowest native ISO on my Canon 6D. The lowest ISO produces the highest quality image with the lowest amount of noise. I will sometimes go to ISO400 if the conditions require, which is normally if there are fast moving clouds or trees blowing around and I need faster shutter speeds. I always use a tripod, so shutter speed is not a concern with regard to camera shake. But I can change the ISO if I want to change the shutter speed. I sort of glossed over the shutter speed. As I always use a tripod I am not worried about camera shake. The only relevance here is if there is something moving in the scene, typically the sea, clouds or trees. Now I like a bit of movement on my sea, so I don’t worry about this. I have a range of tripods, normal Manfrotto tripods, a tiny Manfrotto Pixi and also a Platypod – basically a metal plate which I can fix my camera to and place it on the ground to get a great low viewpoint. All the stuff above applies whichever camera you are using. Now for some stuff specific to the Canon 6D. When I say specific to the Canon 6D you can do many if not all of these things with other cameras, they are just called different things by different camera manufacturers. I change the shutter speed by varying the ISO after I have chosen the aperture for the composition. Aperture, shutter speed and ISO all combine to make an exposure. I choose an aperture, then change the ISO if I need to change the shutter speed. This is a custom function setting on the Canon 6D. Basically I focus using the AF-ON button on the back of the camera. This post is not an explanation of back-button focus - check out this excellent article on Digital Photography School to find out more. I use a combination of Live View and the viewfinder to compose the image – it just depends. And when it comes to focussing as a rule of thumb I focus one-third into the scene, using either Live View or the viewfinder. Once I have focussed I can take as many photos as I like as exposure and image capture are separate from focussing. As I am auto-bracketing and using the 10 second-self timer that is sorted. Self-timer - my secret weapon! I use the 10-second self-timer built into my camera. I used to use a remote release, but much prefer doing this as it works a treat and means I have one less thing to carry, go wrong and get batteries for. And using the self-timer means that all I need to do is press the shutter release button whenever I want to take a photo – I am not sat behind my camera peering through my viewfinder – I am normally sat on the floor next to it. I always use the GPS on my Canon 6D. It drains the battery, but the locational information is invaluable to me as a travel photographer. I only ever shoot in RAW, never in JPEG. RAW gives me the maximum data to work with in Lightroom. As I shoot in RAW I can use Auto White Balance – I don’t need to worry about this till later. Am I being lazy? I would rather say smart – this gives me one less thing to worry about. When I am photographing the sunrise, I use auto exposure bracketing, where I take three exposures. The first exposure is the correct exposure – the one that the camera tells me is the correct exposure. As I am using AV mode the camera works this out for me by varying the shutter speed. If the shutter speed for the correct exposure is 1/1000thsecond, the second shutter speed is two stops faster, (1/4000thsecond) letting less light in creating a darker image. The third exposure is two stops slower than the first exposure, (1/400thsecond) which is lighter. This is what they look like in Lightroom. Why do I take three photos? I take three photos which I merge together in Lightroom later. This is called HDR photography. HDR is High Dynamic Range. Basically, I get more of the lights and more of the darks than my Canon 6D can capture in a single image, which I can merge together in Lightroom. My workflow has evolved over the years to make taking photos as easy as possible. With the settings I have described here and the techniques I use I am able to concentrate on what I am taking a photo of. Everything else is set before I take a photo. HDR photography gets more information from a scene recorded by the camera. And there is another benefit – I don’t need to worry about the exposure of the image capture – I have so much built-in latitude this is no longer an issue? Some purists might see this as being lazy – again I think this is a smart way to work, which helps me take better photos and enjoy myself much more than I would if I was fiddling around with camera settings. And this is what I did for years until I thought about it all. Remember that my workflow is an evolution of a lifetime of practising and learning about photography – a process that is an ongoing one – learning for me never ends! And with that lets look at some sunrise photos that I have taken, and the settings that I used to get them. Here are the five sunrise photos that I have taken along with the camera settings used. All five photos were taken with my Canon 6D and Canon 17-40mm, 24-105mm or 70-200mm lenses using the settings mentioned above. The only variables are the aperture, shutter and ISO which of course vary depending on the light in the scene I am photographing. This was after sunrise, but I included this photo to demonstrate the point I made about the use of the minimum aperture on my Canon 17-40mm lens – this is how I get the sun looking like this. And using auto-bracketing I can shoot straight into the sun and not have a wildly incorrect exposure. A word of caution here – be careful photographing straight into the sun! Why ISO 400? In this scene the clouds were moving very fast so didn’t want a shutter speed slower than 1/125th second. I used F8 as this photo was taken using my Canon 70-200mm lens! Just to disprove a point this photo was taken with my camera in Programme Mode. This was a mistake. I had been shooting video and forgot to change back to AV Mode. But you can see how the camera has still managed to capture all of the scene! All the photos I take are added to a single catalogue in Lightroom. On import I add an amount of processing to each and every image – this is stuff that I used to do manually to every image I was editing. My images start off 30% processed when I start to look at them. Once I have chosen the images that I want to edit I do a form of batch processing. I carry out an HDR merge on the first set of three images, and if all the settings re ok I select the next batch of three images and us the Lightroom keyboard shortcut Shift Control H. This starts up the HDR merge process. I then move on to the next three, and on and on. I have had Lightroom do 30 HDR merges at once – I go off and do something else and leave Lightroom to it. This gives me all the HDR dng files to work with, which is an excellent starting point. I will write another post about editing sunrise photos in a future blog post. Well to be honest I don’t have as many sunsets as I do sunrises. Sunrise is my time – I get up early on my own and get out there and photograph the dawning of a new day. I do not inflict this on anyway else, and that is just fine for all of us! But sunsets are at a much more sociable time, so I have less of them! I hope that you have found my photography blog post “Sunrise Photography Settings That Work For Me Every Time” interesting and of use. If you have any questions please get in touch – I always reply to anyone who takes the time to get in touch with me. 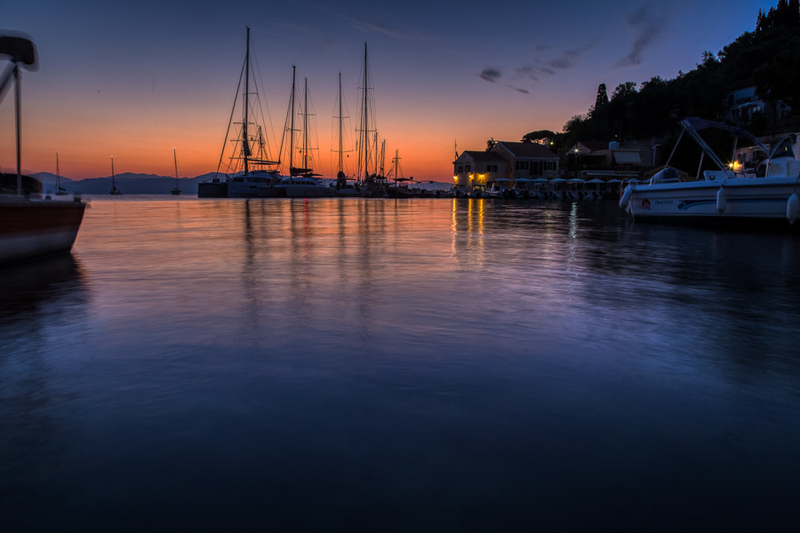 And while I am on the subject of travel photography check out my other websites Photos of Santorini and Paxos Travel Guide.